The Tuscany Region of Italy is one of my favorites. It is filled with history, culture and food traditions that have been handed down over many generations. Join me as we explore the villages, the markets, the regional specialties, the wines and the food in this delightful area of Italy. We will get to know the people, the history and the culture of the region along the way. On arrival day, we will meet you in the afternoon at the airport or train station in Florence, Italy. From there, we will drive you to a beautiful villa in the Tuscan countryside where we will stay for the week. That evening, we will enjoy a multiple-course meal together as you relax and settle in. On day two, we will start the day with an Italian-style breakfast. We will then explore the tower village of San Gimignano, followed by lunch at one of my favorite restaurants. That afternoon, we will have a tasting of extraordinary wines at a local winery..That evening, we will cook together using the finest local and seasonal ingredients. That will be followed by a Tuscan-style dinner. We will start the next day with an Italian-style breakfast. We will then drive to one of my favorite wineries in Chianti where we will have a hands-on cooking class with an accomplished Italian chef. We will enjoy our delicious creations paired with the wines made onsite at the winery. In the afternoon, we will visit the tiny village of Panzano to buy porcetta from world-renowned butcher, Dario Cecchini. That night, we will have a porcetta dinner and explore the chocolates of Tuscany. On day four, after our Italian-style breakfast, we will visit beautiful and historic Siena. After a leisurely tour of the town, we will have lunch at a favorite local restaurant. In the afternoon, we will explore the village of Castellina in Chianti. That evening, will have dinner prepared for us at the villa by a local chef. On day five, we will have an early breakfast and then visit the phenomenal city of Florence. In Florence, we will explore the San Lorenzo market and the Mercato Centrale food market. After a nice lunch at one of my favorite restaurants, we will explore some of the sites of this spectacular city. That night, we will prepare a light Tuscan meal at the villa. On day six, we will visit the local village of Radda in Chianti. We will then visit a beautiful organic farm for a spectacular multi-course lunch prepared from ingredients grown and raised on their farm. That night, we will enjoy a light meal at the farmhouse as we prepare to leave the following morning. 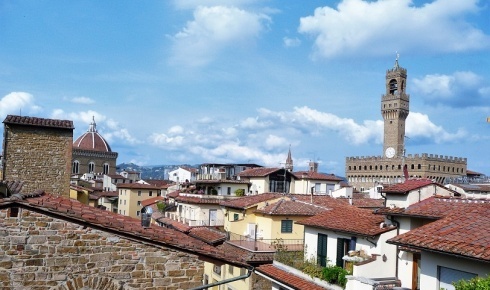 On day 7, we will enjoy an Italian-style breakfast and then depart the villa for the Florence airport or train station. Menus for prepared meals can be adjusted to accomodate food allergies with advanced notice. Getaways in Tuscany are intimate and limited to small groups. The focus is on local, seasonal ingredients and recipes. The recipes are designed to prepare at home. Instruction is in English. Food allergies can be accommodated for with advance notice. Local transportation within Tuscany, all meals and lodging (in a villa) are included. The cost for the culinary week is $5500 per person (based on double occupancy). There is a $500 supplement for single lodging. Travel to/from Florence, is not included.